Making its first inauspicious appearance during the war of 1812 against Napoleonic France, the airship was later to serve as a vital step in the development of Russian air power, proving invaluable as bombing craft in World War I. And today the airship could be witnessing a minor renaissance. 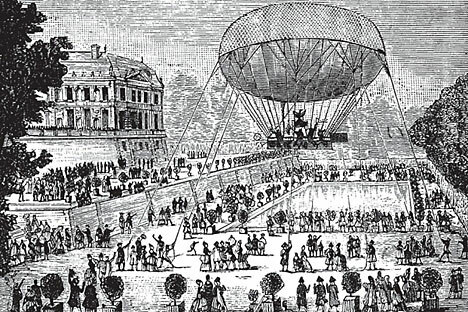 The early blimp was meant to help the Russian Army halt Napoleon's invading forces, but it was plagued with problems. Above all, the material leaked and the paddles constantly broke. By the time the Russians finally turned and fought a bloody and inconclusive engagement with the invaders at the Battle of Borodino the device was still not ready and it was ultimately dismantled, its wooden platform burned and its designer disgraced. Until the early 20th century, it was generally only isolated enthusiasts who still tinkered with airship design. The original idea of attacking the enemy from the air was not embraced by the Tsarist army, although in 1887 the idea was also taken up by the future father of Russian cosmonautics, Konstantin Tsiolkovsky. During the First World War, Russia built two airships, including the world's largest, the “Air Cruiser", which was 150 meters long and could fly at 50 mph. Including foreign-built models, the Russian Army deployed seven airships from 1914-1917, providing invaluable support to troops on the ground.